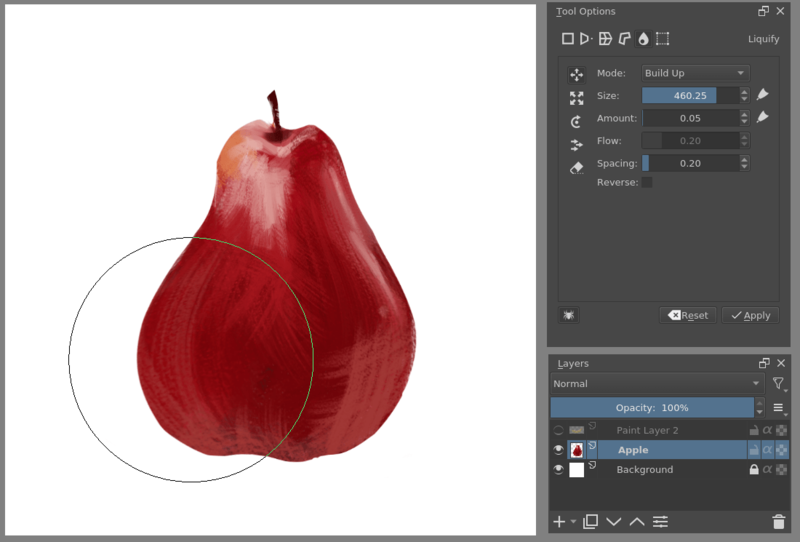 The Transform tool lets you quickly transform the current selection or layer. Basic transformation options include resize, rotate and skew. In addition, you have the option to apply advanced transforms such as Perspective, Warp, Cage and Liquid. 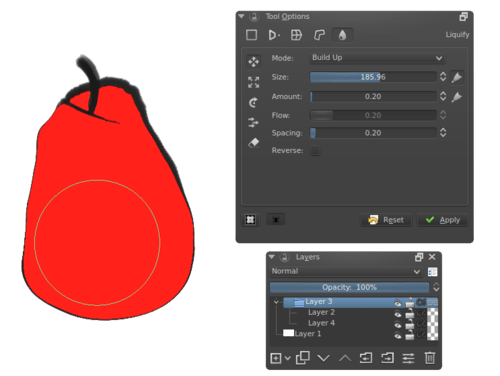 These are all powerful options and will give you complete control over your selections/layers. 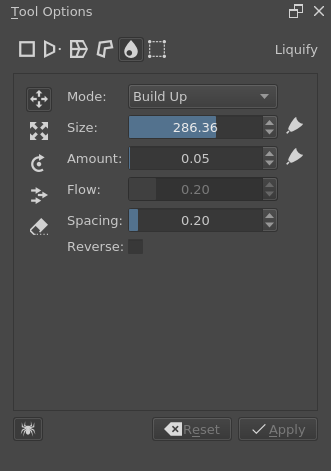 When you first invoke the tool, handles will appear at the corners and sides, which you can use to resize your selection or layer. You can perform rotations by moving the mouse above or to the left of the handles and dragging it. You can also click anywhere inside the selection or layer and move it by dragging the mouse. You can fine-tune the transform tool parameters using tool options docker. The parameters are split between five tabs: Free Transform, Warp, Perspective, Cage and Liquify. This allows you to do basic rotation, resizing, flipping, and even perspective skewing if you hold Ctrl. Holding the Shift key will maintain your aspect ratio throughout the transform. If you look at the bottom, there are quick buttons for flipping horizontally, vertically and rotating 90 degrees left and right. Furthermore, the button to the left of the anchor point widget allows you to choose whether to always transform using the anchor point, or not. 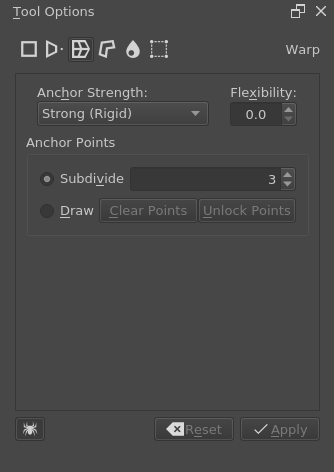 Video of how to use the anchor point for resizing. 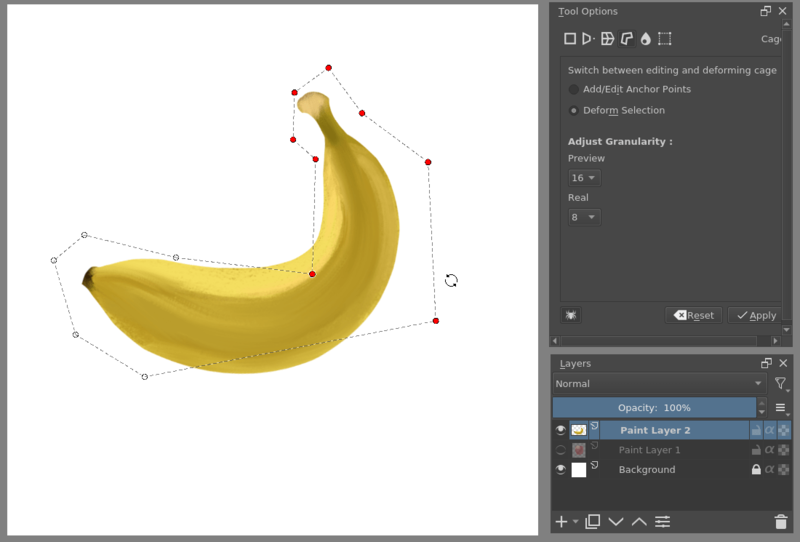 While free transform has some perspective options, the perspective transform allows for maximum control. 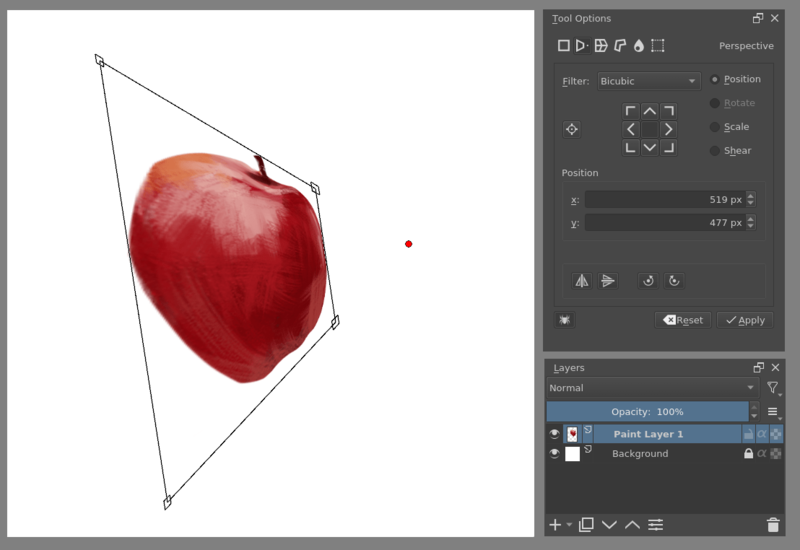 You can drag the corner points, or even the designated vanishing point. You can also change the size, shear and position transform while remaining in perspective with the tool-options. Warp allows you to deform the image by dragging from a grid or choosing the dragging points yourself. There are warp options: Rigid, Affine and Similtude. These change the algorithm used to determine the strength of the deformation. The flexibility determines, how strong the effect of moving these points are. You can divide these either by subdivision or drawing custom points. This allows you to subdivide the selected area into a grid. Draw the anchor points yourself. Locking the points will put you in transform mode. Unlocking the points back into edit mode. Create a cage around an image, and when it’s closed, you can use it to deform the image. 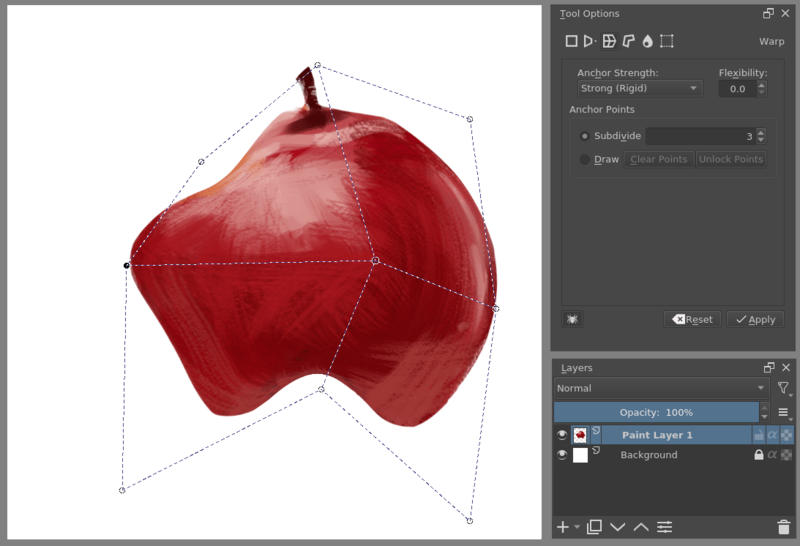 If you have at the least 3 points on the canvas, you can choose to switch between deforming and editing the existing points. Both Cage and Warp use little nodes. These nodes can be selected and deselected together by pressing Ctrl before clicking nodes. Then you can move them by pressing the cursor inside the bounding box. Rotating is done by pressing and dragging the cursor outside the bounding box and scaling the same, only one presses Ctrl before doing the motion. 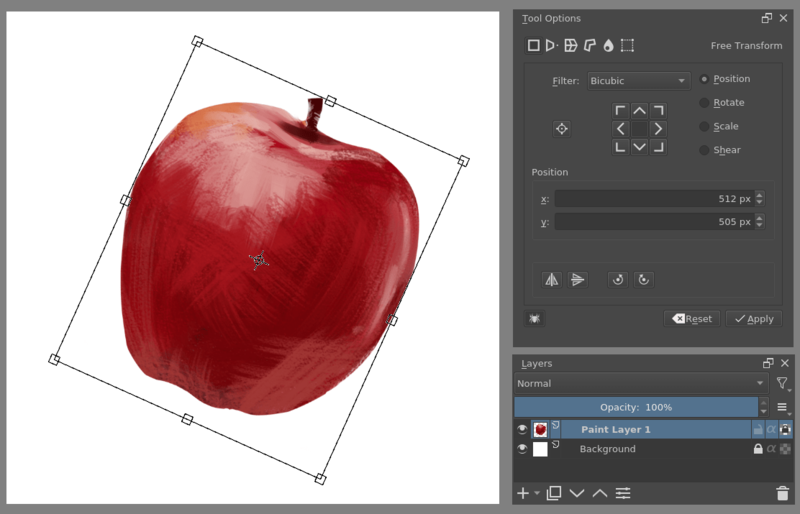 Like our deform brush, the liquify brush allows you to draw the deformations straight on the canvas. Drag the image along the brush stroke. Grow/Shrink the image under the cursor. Shift the image under the cursor. Erases the actions of other tools. This is either Wash or Build up. Wash will normalize the effect to be between none, and the amount parameter as maximum. Build up will just add on until it’s impossible. The brush size. The button to the right allow you to let it scale with pressure. The strength of the brush. The button to the right lets it scale with tablet pressure. Only applicable with Build up. The spacing of the liquify dabs. Reverses the action, so grow becomes shrink, rotate results in clockwise becoming counter-clockwise. 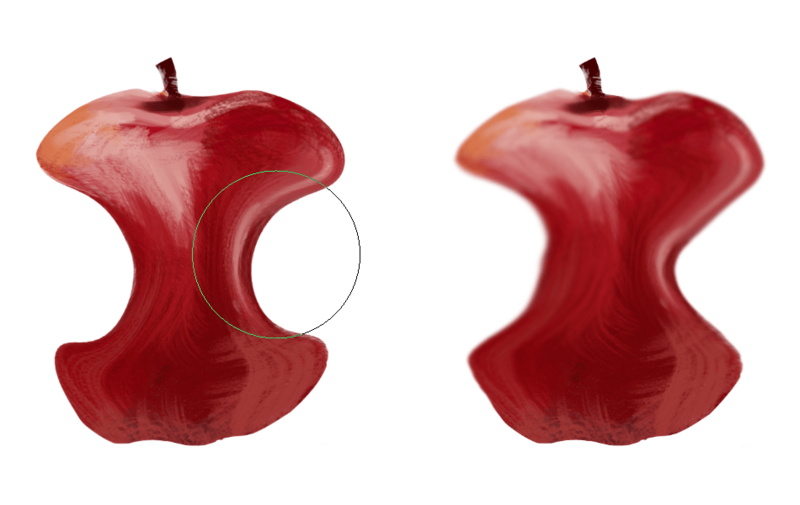 Krita also has a Deform Brush Engine which is much faster than liquify, but has less quality. If you are attempting to make liquefy a little faster, note that it speeds up with the less information it needs to process, so working with liquefy within a selection or using liquefy on a separate layer with little on it will greatly enhance the speed. 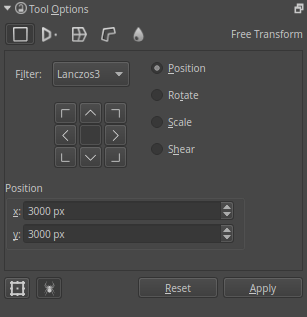 The little spider icon on the lower-left of the transform tool options is the Recursive Transform. Recursive transform, when toggled, allows you to mass-transform all the layers in a group when only transforming the group. If you apply a transformation, and try to start a new one directly afterwards, Krita will attempt to recall the previous transform, so you can continue it. This is the continuous transform. You can press Esc to cancel this and start a new transform, or press Reset in the tool options while no transform is active. These allow you make non-destructive transforms, check here for more info.